In July 2016, G20 trade ministers endorsed the G20's nine Guiding Principles for Global Investment Policymaking1. In June 2016, UNCTAD's flagship World Investment Report showed that FDI flows "soared" in 2015 to its highest level since the crisis (UNCTAD 2016). To be fair, UNCTAD officials were cautious about the prospects for FDI in 2016. The latest Global Trade Alert report - released in advance of the G20 Leaders' Summit in Hangzhou, China - critically evaluates the recovery of FDI, the G20's contribution to that recovery, the coherence of G20 trade and investment policies, and ultimately, the new G20 Guiding Principles. While global FDI inflows have reached a crisis-era peak, FDI into G20 nations has yet to break out of a narrow range witnessed since 2009. Despite rising in 2015, global FDI flows remain 33% below their long-term trend (ascertained using 1990-2005 data); G20 FDI inflows are 40% still below trend. As shares of the global stock of FDI and global investment spending, latest FDI flows remain below crisis-era peaks. Properly benchmarked, greenfield FDI has yet to recover to levels seen before the boom years preceding the crisis. By adopting the Guiding Principles for Global Investment Policymaking, G20 trade ministers have aligned themselves with a central objective of the G20 - namely, restoring economic growth. In essence, the rest of our report evaluates whether G20 commercial policymaking has been investment-friendly, that is, pro-growth. Has the G20 really promoted cross-border investment? Since November 2008, G20 governments have implemented just over 150 reforms to their FDI regimes. Unfortunately, they’ve taken nearly as many steps that harm foreign investors. Even so, this is the brightest spot in G20’s investment-related track record. Seven emerging markets account for the lion’s share of G20 investment policy changes. Richer OECD G20 members have made far fewer changes to their FDI regimes. By now, the sustained violation of the G20’s pledge on protectionism has resulted in nearly 4,000 trade barriers and distortionary incentives that will distort calculations on the financial return to FDI. Trade in investment goods is significantly distorted by G20 policy intervention. The total number of measures liberalising trade in capital goods currently in force today is outnumbered by discriminatory and restrictive policy interventions by more than 10 to one. No statistic better highlights the growth-threatening nature of G20 commercial policies. Investment flourishes in a stable business environment with low levels of corporate political risk. We used well-regarded indices of economic policy uncertainty2 to gauge whether policy risks faced since the onset of the global trade plateau in January 2015 had fallen below levels seen in 2010-4 and 2002-6. 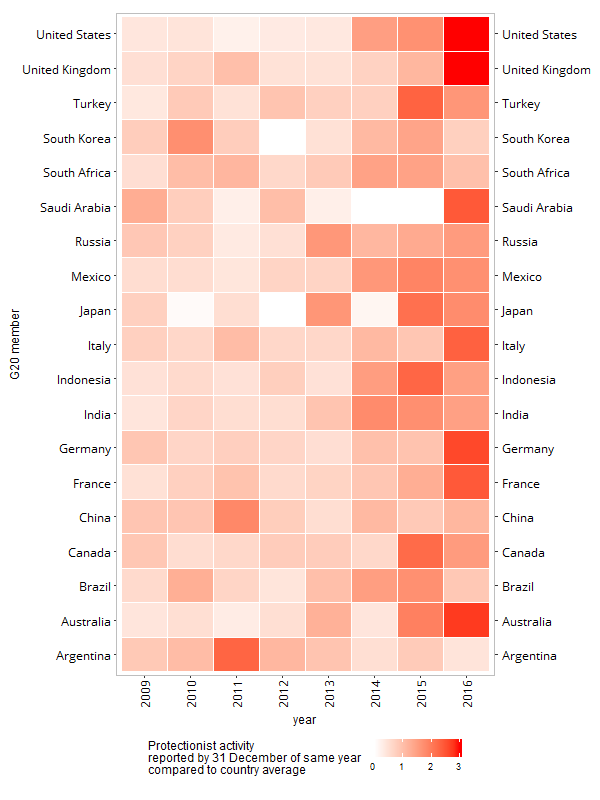 For 11 of the 12 G20 nations for which such data is available, the message is clear: policy-related risks remain elevated compared to the before the crisis. For Brazil and China, levels of corporate political risk are even higher during 2015-6 than in 2010-4. What does this mean for the G20’s investment initiative? The good news is that G20 trade officials have put their fingers on a major problem. The bad news is that lack of clarity or follow up work programme for the Guiding Principles casts doubt on whether their fine words will translate into tangible reforms (see Chapter 6 of the GTA report for more details). When reporting lags - which tend to bias down the amount of protectionism reported in the most recent years - are properly accounted for, the acceleration in the G20’s resort to protectionism since 2012 becomes evident (Figure 1). In the first eight months of 2016 alone, G20 governments implemented nearly 350 measures that harmed foreign interests. The jumps in G20 protectionism in 2015 and 2016 coincide ominously with the halt in the growth of global trade volumes. This report contains new features that help evaluate changes over time in commercial policy stance of each G20 member. Relative to their average annual performance since the onset of the crisis, there has been a pronounced worsening of commercial policy in Australia, France, Germany, Italy, Saudi Arabia, the UK, and the US during 2015 and 2016 (Figure 2). As a result of adding over the past three years on average 2,000 new entries per annum to the GTA database, a more comprehensive picture of G20 crisis-era protectionism can be drawn. 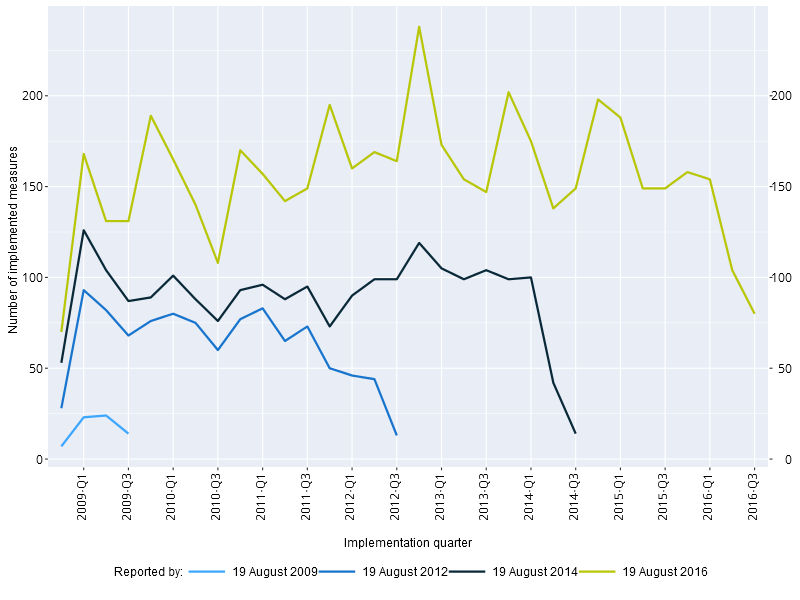 Figure 3 reports the number of protectionist measures implemented by the G20 nations per quarter that were documented by 19 August 2016 (the date data collection for this report ceased) and on the same day of the year in 2009, 2012, and 2014. The upward revisions in the quarterly totals should be a cause for concern and highlight the importance of sustained monitoring and updating. Arguments that G20 protectionism spiked in early 2009 and was brought under control through self-restraint, monitoring by international organisations, or multilateral rules can be safely dispatched. The system hasn’t worked. To reinforce the arguments why protectionism should be taken seriously by G20 Leaders, for each G20 member for the first time in these reports, we publish estimates of the percentage of national exports that face trade distortions in foreign markets implemented since November 2008 (see the country annexes of the report). Even though over time some protectionism lapses or is withdrawn, no G20 member has seen falls in the percentage of their exports facing trade distortions in foreign markets. These trade coverage estimates highlight the relative importance of different trade distortions - while trade defence duties aren’t an across-the-board threat, there is little to be sanguine about for other commonly-used policy instruments. The most charitable take on the G20’s track record on cross-border investment is that there is plenty of room for improvement as the G20's Guiding Principles are implemented. Only a credible change of tack by G20 governments that results in reduced corporate political risk will induce the private sector to invest more at home and across borders. This could become the G20’s commercial policy contribution to tackling secular stagnation (Baldwin and Tuelings 2014). G20 trade ministers will find it hard to pull the wool over the eyes of corporate board members who are ultimately responsible to shareholders for their investment decisions. Time will tell if G20 trade officials can contribute more to promoting cross-border investment in a transparent, non-distorting manner than they have to resisting protectionism. The closer trade and investment policy is to the growth-promoting G20 mission, the more trade officials will be expected to deliver. Baldwin, Richard, and Coen Teulings (ed.) (2014). Secular Stagnation: Facts, Causes and Cures. CEPR Press. 15 August. ICTSD (2016) (ed.) G20 Hangzhou Summit: Proposals for Trade, Investment, and Sustainable Development Outcomes. July. UNCTAD (2016). World Investment Report. Investor Nationality: Policy Changes. Geneva. June.